I love vegetables. I love rice. So, it makes perfect sense to combine the two. I guess that is why they've been doing it for centuries. 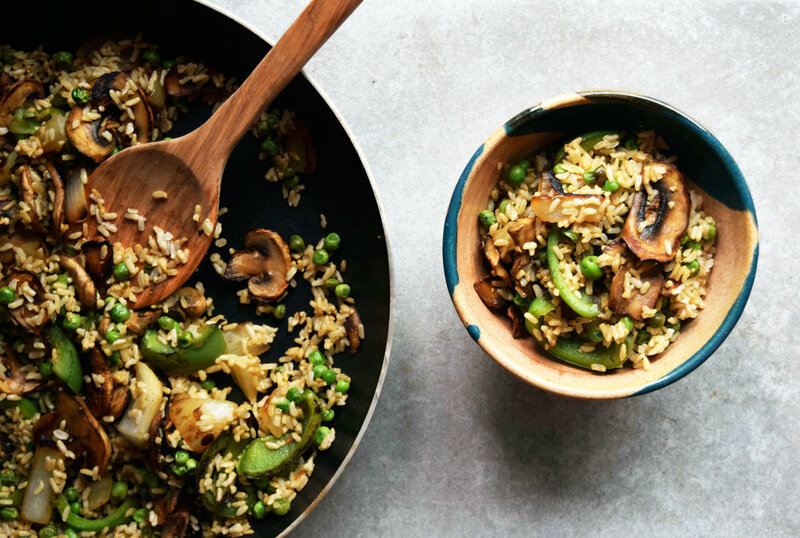 Normally, I make fried rice (like this recipe) with Asian influences like peanut or sesame oil, shiitake mushrooms, green onions, tofu and edamame. This time I am using ingredients from my local farmer's market- making a literal farm to table 'fried' rice. Cook the rice according to the packaging. I used 2 cups of brown rice to 1 3/4 cups of boiling water. While the rice is cooking, wash and cut the pepper and yellow onion so that they're the same size of the mushrooms and therefore will cook evenly. Cook the mushrooms, green pepper and onions in a pan with a drizzle of olive oil. Let cook, stirring occasionally, for fifeteen minutes until the vegetables brown. Add in the peas and let cook for another five minutes. When the rice has finished cooking, stir it into the vegetables with the lemon juice, salt and pepper. Cook for another five minutes and serve.